With the growth in internet, malwares are increasing too. Nowadays most of the malwares use the ‘autorun.inf’ file to infect computers and most of us are completely unaware of it. This is usually in the case of pen drives, hard disk drives, etc. When a device is infected with a malware and an ‘autorun.inf’ file is dropped, the shell menu is normally modified to execute the malware whenever the unsuspecting user double-clicks the infected drive. I came across a small program- Autorun Eater which allows you to get rid of such autorun files. It removes suspicious ‘autorun.inf‘ files even before the user attempts to access the drive. These files are auto-backup’ed in case of false positives. I’m pretty pleased with this program as its user friendly and quite effective too. Once you start it, it is placed in the taskbar. You can right click on it and you should get a menu like the one showed above. 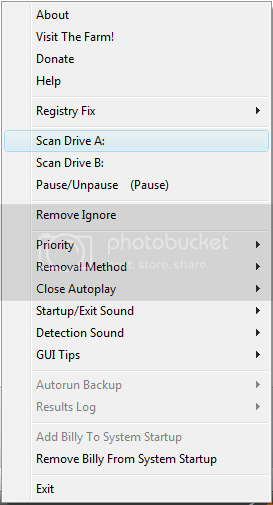 Choose the drive you want to scan and it should start scanning. It also helps you to get rid of task manager disabled error, regedit disabled, folder hide option disabled, etc. Just go to registry fix and under it you can choose to fix any of the problems mentioned. You can also try out Combo Fix which is a great software which allows you to get rid of all sorts of malware.